The perfect fuel for your AK range day! Red Army Standard’s 7.62x39 FMJ rounds are ideal for feeding your WASR-10, Arsenal AK-47, Mini-30 or other suitably chambered rifle. 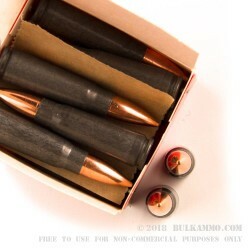 These Red Army rounds feature a 123-grain, bi-metal full metal jacket projectile capable of a muzzle velocity of 1080 FPS. They come loaded in a Berdan-primed, noncorrosive steel case and feature a lacquered case for better long-term storage, feeding and extraction. These rounds also incorporate a sealed primer and neck for better corrosion resistance. Each case includes 180 rounds of 7.62x39mm Red Army Standard. Red Army Standard ammunition is made in Russia and is imported by Century Arms. Century International Arms is based out of Delray Beach, Florida and is a popular importer of international firearms such as a variety of AK’s and the Canik line of pistols. Q: Is this ammo magnetic? A: Hello Tristan, These 123gr. FMJ rounds by Red Army in 7.62x39 do have a steel case and will attract a magnet. For ranges that do not allow magnetic rounds, I would suggest a brass cased round.